Pietro Masturzo won the new edition of the World Press Photo: women on the roof during the protests in Iran. After his arrest, the only way to document what was happening was to shoot from the roof. Categories: events, news, visions | Tags: communication, elections, Iran, people, photocontest, photographer, photography, Pietro Masturzo, World Press Photo, WPP | Permalink. 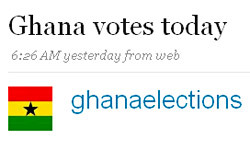 Ghana just voted yesterday for the Presidential Elections and many observers followed the elections using twitter. Read what happened on Global Voices. Categories: news | Tags: Africa, election monitoring, elections, ghana, twitter, web | Permalink.